descended upon him to hear what he might say. They wanted to be present if revolution was going to start or if was going to start healing and doing more miracles.One of the leaders of the synagogue named Jairus--a very important man--came to Jesus. The crowd eased as he drew near to Jesus partly because they respected Jairus but also partly because they wanted to witness this interaction. He fell down at Jesus' feet and begged him through tears to heal his dying daughter. He said, "My daughter--my dear little girl--is standing on the doorway to death right now! I've seen what you can do.Please come right now--waste no time--so that you can lay your hands on her to heal her. I believe that she will be made well if you will come and give her life." Jesus picked him up and said he'd go if Jairus would take him there. The crowd could smell the impending miracle on the air and wondered--some out loud--if Jesus was up to this task.They pressed around him so that the walking was slow because they didn't want to miss a single word or moment. 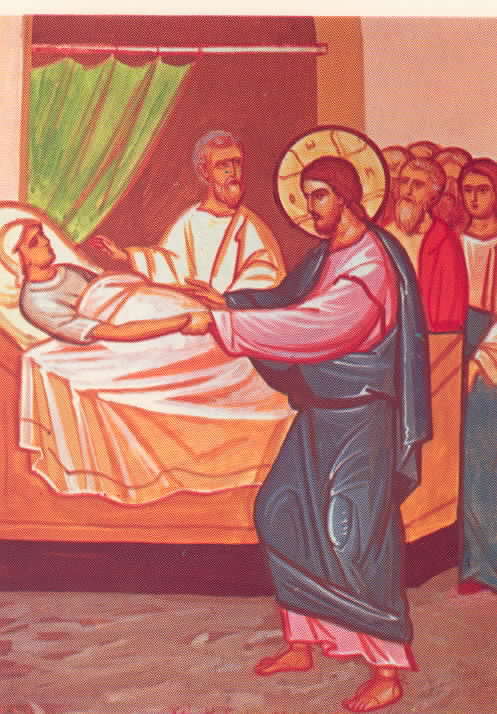 As Jairus tried to hurry to his home and his dying daughter a woman was sliding between members of the crowd so that she could get close enough to Jesus to touch his cloak. She had spent every last coin she had on physicians for a bleeding condition that still persisted. She was unclean because of this constant flow of blood and she was getting much worse. She had heard about Jesus and so she drew near to him thinking that she would be healed if only she could touch the clothing of such a wonderful worker of miracles. She didn't want to delay Jesus on his trip to save Jairus' daughter and so she meekly reached her hand out to grasp his cloak for a moment trusting that she would be made well by this act. When she touched him, she immediately knew she was cured and, content to remain anonymous, she began withdrawing from Jesus and back into the crowd. But Jesus knew immediately that somebody had touched him because he could feel the surge of life that had left him and crushed the woman's disease. Jesus stopped the crowd and asked, "Who just touched my clothing?" The woman's heart must have skipped a beat as he began looking into the faces of those around him. The disciples tried to convince him that it could have been anybody and it was somewhat silly to ask who touched him when he was surrounded by an interested crowd pressing in on him. Finally, the woman came forward and with a trembling voice admitted that it had been her. She fell down at his feet and told her whole story. Jesus listened to every word and then picked her up and said, "Daughter, it is your faith that makes you well. Go in peace and be healed." While all this was happening, some of Jairus' servants drew near to him to share bad news with him. They didn't want to embarrass their master so they tried to whisper to him that his daughter had just died. They advised Jairus to slip away and leave Jesus alone. But Jesus heard their well-meaning but faithless advice and looked into Jairus' eyes and said, "Don't fear. Trust me." From that point on, Jesus only let Peter, James, and John come with him as they followed Jairus to his home. There were people weeping outside of Jairus' home when they arrived and Jesus asked them, "Why are you crying? Don't you know that the girl is only sleeping?" Through their tears they laughed at Jesus because they knew death all too well and were uninterested in hearing the words of a reputed healer who didn't seem to get it. Jesus ordered that all of the mourners, friends, and family--except for Jairus', Jairus' wife, Peter, James, and John--be removed from the house. When they were gone, he took the dead girl's hand and said, "Come little girl, it's time to get up." She opened her eyes as if awakening from sleep and the people there were shocked to see death forbidden and undone with a few words. Jesus told them not to spread the story and that they should give the girl something to eat because she was hungry.